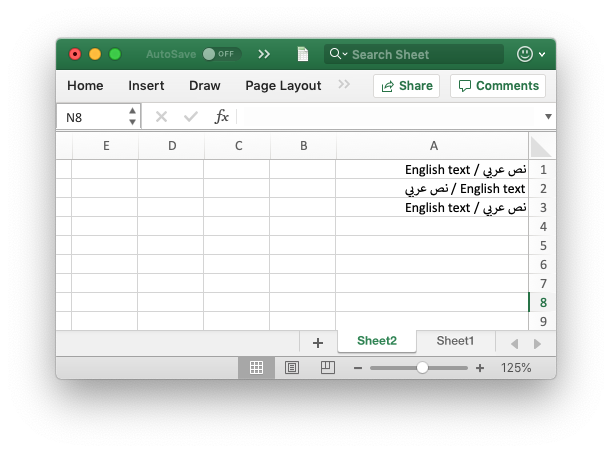 Example of how to use Python and the XlsxWriter module to change the default worksheet and cell text direction from left-to-right to right-to-left as required by some middle eastern versions of Excel. Note, this a Python2 unicode version. Remove the u'' to make this work with Python3. See also the unicode_python3.py. # required by some middle eastern versions of Excel. # Python3. See also the unicode_python3.py example. # Add the cell formats. # Make the columns wider for clarity. # Change the direction for worksheet2. # Write some data to show the difference. worksheet1.write('A1', u'نص عربي / English text')  # Default direction. worksheet2.write('A1', u'نص عربي / English text')  # Default direction.